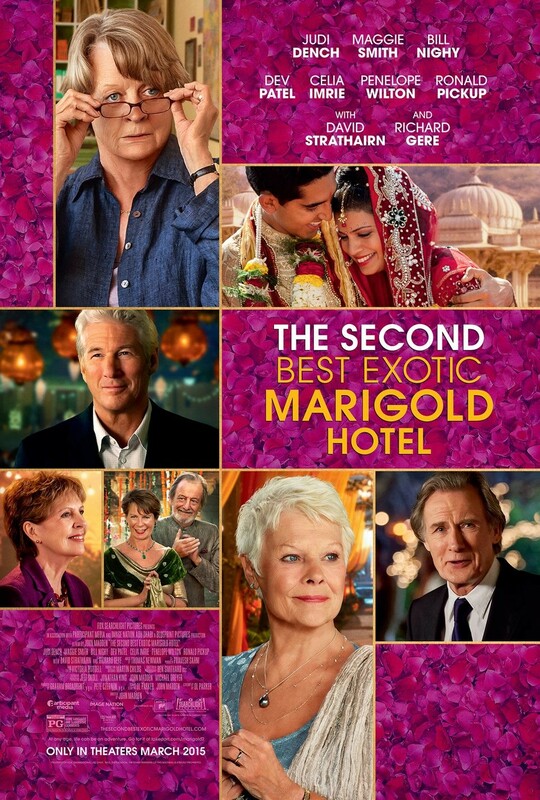 I don’t remember when I read about a sequel having been made to 2011’s The Best Exotic Marigold Hotel, but the minute I found out, I had to look into it. I remember the first one having a few heartwarming moments and funny, but not nearly as much as this one turned out to be. I recall feeling a little let down by the first movie, because the trailer had led me to believe that I was going to see more comedic moments than anything else, and it had turned out to be more serious. I think this sequel hit a lot more on what I had been hoping for from the first, so I am glad that I gave it a shot. This movie really was such a joy, for so many reasons. From the start, I couldn’t stop laughing. (Some of the scenes were super awkward, so for a person like me they were incredibly embarrassing to watch, but still funny.) If memory serves me correctly, I think a lot of critics slammed this film, and I find it no surprise that after watching it myself, I can say I disagree with the naysayers. This is one of those rare cases where I actually felt like the sequel was better than the first movie. There’s a lot going on in this film as there was the last time. It’s like watching a book of vignettes unfold on screen. I enjoyed watching all the little stories unfold separately as well as when they overlapped. There’s a lot of different themes going on here; beginnings and endings, old and new, love and loss, and definitely a sense of family. The humor (and film itself, I suppose) does seem to be targeted towards an older crowd, but I still found it relevant and loved it. Some parts of the story were confusing—like storylines would get started and then kind of dangle their loose ends, and by the time the movie picks them back up again, I kind of forgot what it was they were trying to wrap up in the first place. On other occasions, like the whole side-plot with Dev Patel’s character’s rival, for instance, felt like it could have gotten more fleshed out; maybe even give it a bit more backstory. I think my absolute favorite parts had to be whenever Judi Dench or Maggie Smith came on screen. I appreciated how cranky Smith’s character was, and Dench has such a way with hers as well that I just couldn’t help loving them both for their respective quirks. This isn’t a Bollywood movie, but it definitely gives a little nod to the genre here and there, and I really enjoyed how much they brought India and its people to life here. In fact, I think they did an even better job than the first movie in doing so. Final Thoughts: Had I had the time, I would have seen this in theaters when it was still being shown there. I think it is a movie worth renting. As for whether or not I’d own it, as enjoyable as it was, I do admit that it lacks something to make me want to actually purchase a copy for keeps, but I would rent it multiple times at the same time (though that would be likely over a stretched period).